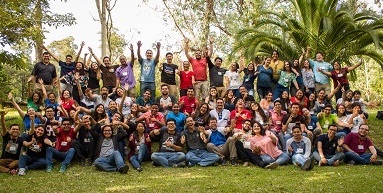 With songs and great joy, the International Gathering of Marist Youth 2019 began on Tuesday, January 15 at the Marist Formation Centre in Guatemala City, Central America. The theme that has accompanied them on this day is " 'The Weaving Begins'". Brother Carlos Alberto Rojas offered the opening words, followed by the intonation of the hymn that will animate the whole Encounter. The afternoon continued with a small prayer to Mary our Good Mother, which was directed by Brother Juan Antonio Sandoval. Br. Hipólito Pérez, Provincial of Central America, welcomed the participants on behalf of the hosts Province to the meeting. At the end of the afternoon, the young people were divided into "life groups", through which they can share their experiences. The day ended with a welcome meal. Representatives of the four Marist branches are participating in this encounter: Marist Fathers, Marist Sisters, Marist Missionary Sisters and Marist Brothers. For this reason, we also have the presence of the Superiors General of each of branches, as well as some General Councillors.